Whether your child is 6 months old, 6 years old, or 16 years old, there are many opportunities to act in commercials. With hundreds of cable channels, children are seen in more advertising now than at any time in the past. There are numerous rewards to helping your child pursue a commercial acting career. You will get to spend high quality time with your child, and he or she will learn poise and self-confidence that can last a lifetime. Plus, it's not unusual to make thousands of dollars for one day's work in a national commercial. Much to the delight of parents, many a child has paid for his or her entire college education by doing a few national spots. While many children and their parents are happy to have a successful career in TV commercials, it can lead to future television and movie roles. For example, Elijah Wood, star of the hit movie Lord of the Rings, got his start in television commercials. Television commercials offer opportunities for all types of children – those who have all-American looks, those who are very attractive, and those who have “character”. The two most important factors of success are a willing (and eager) child, and a parent who is willing to take time out of his or her own schedule to take the budding actor around to auditions and to commercial shoots. 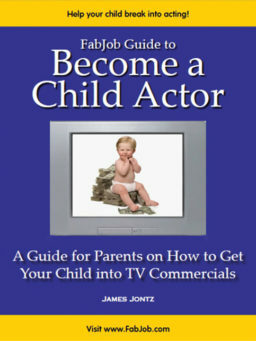 If you qualify on these counts, the FabJob Guide to Become a Child Actor (A Guide for Parents) is for you! In this guide you will discover how to get your child into commercials. If he or she enjoys the experience, the guide will show you how your child can pursue a career as a professional child actor. The guide's author is James Jontz, a director who has worked with many child actors. With his wife, Joanne Ritchie, Jim has taught commercial acting techniques for children for more than a decade and been featured in an article in the New York Times. Joanne has appeared in hundreds of TV commercials, including spots for Tide, Oldsmobile, Lysol, and Hershey's Syrup (for which she earned $75,000 for a single commercial). Do you have what it takes to help your child succeed? What do agents look for in a child actor? You can have all this and more for an incredible price. People pay hundreds or even thousands of dollars for acting courses and conventions for their children. 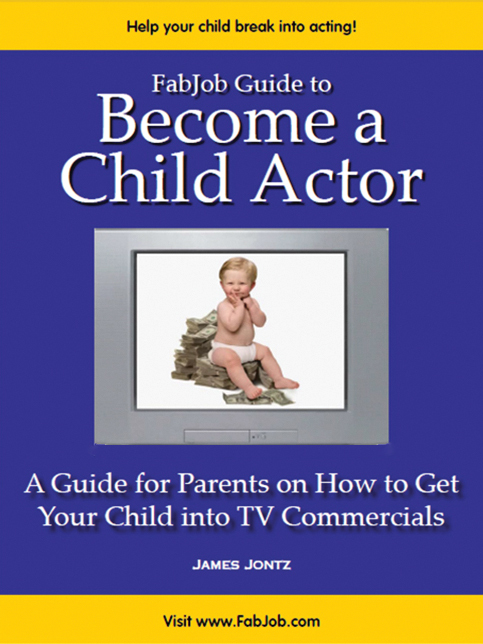 The FabJob Guide to Become a Child Actor (A Guide for Parents) contains some of the best career advice you could get from other sources, plus much more and can help you avoid costly mistakes. The information in this guide can save you many hours of research, help you avoid some costly mistakes,and give you information you need to get your child into acting. Your child can earn back the price of the guide many times over with just one commercial. If you believe your child deserves to have a rewarding career as a child actor, this guide is for you. It gives you what you need to know to help your child get into TV commercials. Don't miss the opportunity to help your child have the career of his or her dreams. If you are undecided, take advantage of our guarantee. Buy it, read it, and if you are not satisfied, your money will be refunded.